Check out our series Rewatch The Throne on Stitcher Premium!! Shut her eyes forever, Arya! I personally don’t want to see that. 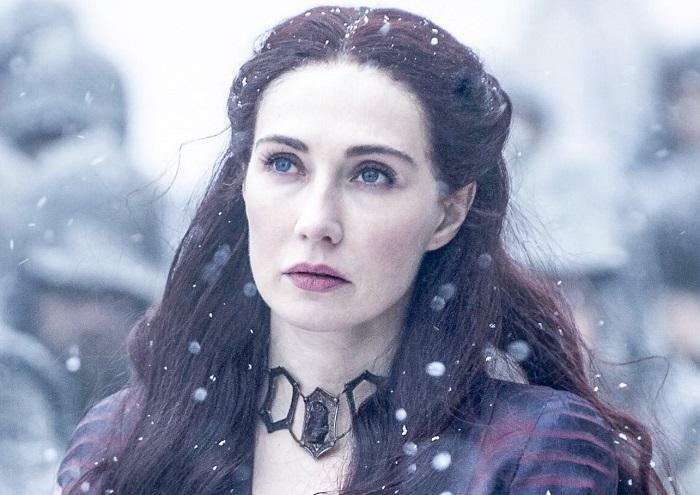 Not because I like Melisandre or anything, but I think she has a bigger role to play than being some revenge fodder for Arya. I could certainly get behind some wight Shireen revenge action on Mel, but I really don’t want to see Arya waste her time killing Mel because of what happened with Gendry back in season 3. I think it would be a regression of Arya’s character. Hopefully she will realize Gendry is just fine before she sees Mel again. Yeah, you’re right. I just saw Mel’s picture and flashed on her scene with Arya. I think Davos must be Melisandre’s undoing. She will come back to Westeros just like she warned Varys, and when she comes into contact with Davos (after she helps save humanity in some fashion, of course) Davos will “execute her himself” as he put it. It must happen, it was too heavily forewarned and Davos deserves the kill more than anybody. Besides, she claims she’s been ready to die for quite some time. (See excerpt below.) I just wonder if narratively speaking she’s entitled to a “clean”, quick death – or the Full MFT*, even if not by Arya. After all, Mel (mis-)led the One True King to his doom …and burned Shireen alive! Anyone who does something that horrendous shouldn’t complain if her exit is not swift and painless. Come to think of it…has Davos ever killed anyone before? I think not. He did save Gendry from being sacrificed to the Lord of Light, and as far as the Red God is concerned “only death can pay for life”, right? * “The Full MFT” = Meryn F*cking Trant-style death. Eyes gouged out; neck stabbed; interrogated and then stabbed again in the liver for not answering when responding is impossible because of punctured lung or severed voice box; whimpering and bleeding out while executioner identifies herself and the reason for the punishment; and finally, throat sliced from ear to ear. ThisGirlHasNoName on Are Jon and Dany Doomed in Season 8 of Game of Thrones?